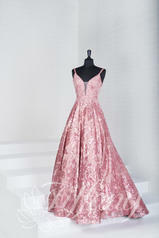 Get that Hollywood style in this spectacular evening gown. The daring bodice has a sensational plunging v-neckline and straps for a chic and timeless look. The innovative, metallic lace bodice offers the versatility of a more modest neckline. Its a-line skirt is wrapped in romantic, glittering floral sequins. V-back with center zipper and train has side pockets.